Hardly a week goes by that somebody in the golf media doesn't say, "The ball doesn't know how old you are." I always laugh when I hear that because, while it's true, I know that not a damn one of 'em believes it. If they did, they wouldn't be so shocked when one of the older players -- translation: a player over 40 -- plays well. 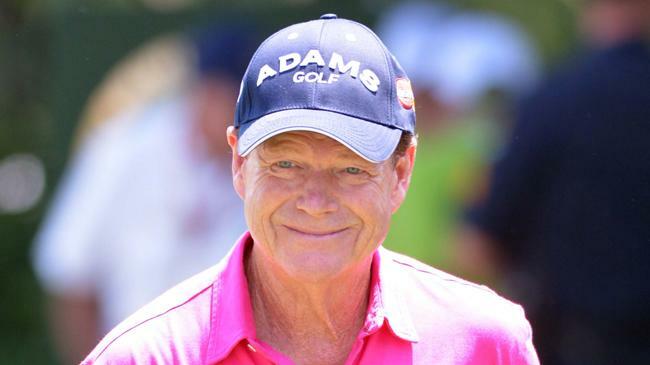 On Saturday, Tom Watson made their jaws drop in surprise once again. For the first time, Tom bettered his age with an 8-under 63. (Tom is 64.) He said it was because he sank a lot of putts. But more than just his putting is working this week. In case you missed it, check out this short game shot from Round 1 that hit the pin on the par-3 8th and stopped a mere foot from the pin... after he chipped it backwards. Tom moved up 43 spots to T12, just 5 shots behind Bernhard Langer (who posted his own 63 in the first round, btw). And as if that wasn't enough, Hale Irwin also beat his age -- by 2 strokes. He shot a 5-under 66 at the ripe old age of 67... and this was his third time beating his age. At some point, I guess the media will finally catch on a little secret: Although golf can be played in a very athletic manner, you don't have to be 6'4" tall and have a 120mph club head speed to score well. And once the older guys start to believe it themselves, at least one of them is going to shatter the record for the oldest player to win a major. That record is held by Julius Boros, who won the 1968 PGA Championship at 48 years, 4 months, 18 days old. Tom nearly won the Open Championship at age 59. Like age, it's just a matter of time.